The working of this terrific Kids trick is very easy. You are supplied with four different jumbo cards with a picture of a Seal on each. 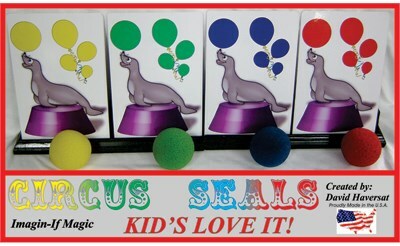 Each seal has a different color ball on his nose. Show the 4 Seals and mix them up. Place them in the supplied stands so you cannot see what color order the Seals are in. Ask for a volunteer to point to one card as you turn your back to the audience. Instruct the volunteer to pick up the card they pointed to, show it to the audience and place it back in the stand. Now the fun begins. Guess three times what color they selected, of course getting all three guesses wrong. Finally admit you give up, turn around, and the selected color ball is seen on your nose, trying to act like you are balancing the ball on your nose. Comes complete with 4 Circus Seal Cards in full color (4.5" x 7" - Jumbo Card Stock), 1 Card Stand with hinge (takes up less space), and 4 - 2" Gosh Sponge balls slit for sticking on your nose.